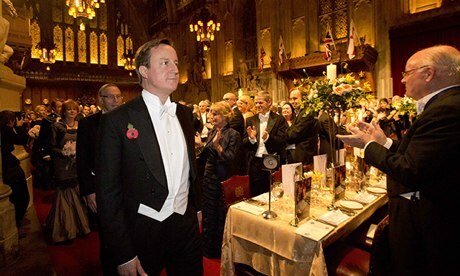 Surrounded by the opulence of the Guildhall’s grandest room, Cameron addressed 900 rich and well-pampered guests enjoying a sumptuous banquet, courtesy of the City of London Corporation’s £12 million fund for ceremony and hospitality. His remarks were in part aimed at the Archbishop of Canterbury, Justin Welby, sitting alongside him. Welby had previously raised concerns about the social impact of cuts to welfare benefits. “At a time when family budgets are tight, it is really worth remembering that this spending [on benefits] comes out of the pockets of the same taxpayers whose living standards we want to see improve. I hope the Archbishop of Canterbury will forgive me for saying—it’s not robbing Peter to pay Paul, but rather robbing Peter to pay Peter,” said Cameron. The implications of Cameron’s remarks are chilling. The NHS budget is being slashed by £20 billion by 2015, around one-fifth of its annual budget. Calls are now being made to increase this to £30 billion. This is being accompanied by speeding up privatisation with the introduction of the Health and Social Care Act of 2012. On the same day Cameron spoke, the Royal College of Nurses revealed that NHS cuts were jeopardising patient safety. The RCN said that there was now a shortage of some 20,000 nurses in the health service, with inadequate staffing a common factor in especially high mortality rates in certain hospitals. Similarly state education is being eroded and privatised with the widespread introduction of academies and free schools. Teachers are currently under a three-year wage freeze and cuts in pension rights have resulted in an estimated 12 percent fall in their pay. This month the Organisation for Economic Co-operation and Development placed the UK on the lowest ranks of 65 countries on educational attainment, behind Russia, Poland and Hungary. In an earlier report, it described British schools as among the most socially segregated in the world. Cameron was unabashed in his glorification of the 1980s Thatcher government, whose policies laid the basis for a British economy which is today a custom-built tool of the banks and super-rich. Britain’s success “in the global race” meant “taking the country that led the agricultural revolution, the industrial revolution and the market-based revolution of the 80s and equipping it to lead the economic revolution of today,” he said. No one would have known that it was the rampant criminality, speculation and money mad profiteering, pioneered and led by the parasites at the London Stock Exchange and Wall Street and their “market-based revolution,” that resulted in the 2008 financial meltdown—a collapse that is paid for out of the living standards of workers in Britain, Europe and globally. 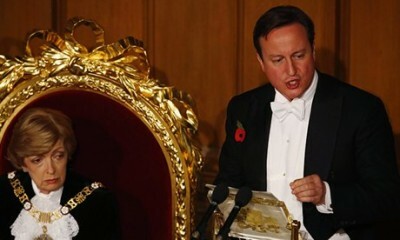 Cameron was at least candid in outlining what the most rapacious sections of the British ruling elite are demanding. The original buccaneers were pirates who robbed Spanish ships in the Caribbean in the 17th century. As the representative of modern day looters, Cameron set out plans to gut public spending still further for the benefit of the super-rich. His government are cutting corporation tax to 20 percent, and “slashing” red tape on business. At the same time he defended the £21.8 billion cuts in welfare since 2010 that are throwing tens of thousands further into poverty. Cameron also announced that he would lead a trade visit to China in early December. On a visit to the country in October, Chancellor George Osborne had warned that it was not appropriate to speak of China as a giant “sweatshop”, holding up its economy—one based on rampant capitalist exploitation by transnational corporations, protected and enforced by the methods of dictatorship—as the model Britain should emulate. While the right wing media hailed Cameron’s speech, the nominally liberal press declared they were taken back by Cameron’s stated aim that austerity should be permanent. The Guardian and the New Statesman both cited Cameron’s claim on coming to office in 2010 at the head of a coalition with the Liberal Democrats that “I didn’t come into politics to make cuts,” in order to claim that the prime minister had changed tack. This is nonsense, designed to chloroform their readers. In April 2009, more than a year before becoming prime minister, Cameron had declared that any government led by him would usher in an “age of austerity”. The media are well aware that this is the real agenda of the coalition—one that is shared by the Labour Party. If they are shocked it is only because Cameron has let the dirty secret of Britain’s ruling elite out of the bag.